The Crowdsourcing.org site and team are doing a very nice job of reporting on, and promoting the crowdsourcing industry. Manufacturing can be one of the key backbones of any country’s economy. Certainly is has been key in the United States for a hundred many years. It’s a topic Derek Singleton of Software Advice (pictured) wrote about today in a post titled Three Ways to Bring Crowdsourcing into Mainstream Manufacturing. He then kindly requested that I comment on it. Ease into crowdsourcing for idea creation. Divide projects to protect intellectual property. Create a single file sharing system for design files. I agree there is great opportunity in many minds coming together on a tough topic. Sometimes a solution is obvious to someone from a different field of expertise simply because they can see the problem via a different lens. Intellectual Ventures has been perfecting that approach for nearly a decade. However, focusing on the title of Derek’s post, about ways to make Crowdsourcing mainstream in manufacturing, it’s useful repost some of my older material. Specifically, using eCommerce as a means to think about how to make Crowdsourcing mainstream in any industry. Online commerce is mainstream now for many reasons, but primarily the list below on the left. It stands to reason that shopping for work done via an online on-demand workforce would need to meet these same criteria to become mainstream. My 2 year old research report goes into detail on this. In particular, the crowd needs to match the need, and payment rate needs to drive quality and timely response. Free Crowdsourcing in development, design, content creation, content review, question answering, etc is represented successfully in successful mega-examples like Wikipedia and Linux. And, it will continue to grow and evolve as a viable means to get productive work done by the crowd. It differs from Paid Crowdsourcing in that work gets accomplished only if it’s entertaining, emotionally fulfilling, or leads to recognition. Other work will simply not get done. 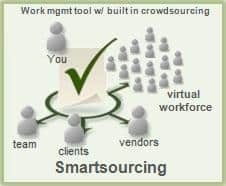 Paid Crowdsourcing vendors provide business people with tools that ensure their work is completed by someone in a timely fashion, at equal or better quality than a full-time workforce. They enable the provision of monetary incentives along with other incentives, like recognition, that improve the likelihood of getting satisfactory results in a timely fashion. The vast majority of work we need addressed would not qualify as fun, therefore, paid crowdsourcing is the path to mainstream. It should come as no surprise that the lion’s share of mature crowdsourcing examples is in the design and web development field. Clearly understood deliverables and lots of fun and recognition incentives (as well as being a good means to compete for clients) increase the likelihood of satisfactory results and reduce the need for high pay rates. Translating the entire internet for free. Duolingo is brilliant. The internet gets translated, while people simultaneously learn a language for free – something they are currently paying in both time and money to do anyway. Brilliant. Watch this video, it entertaining and amazing. Keep up the good work Luis. What a difference 5 years make. When Jeff Howe coined the term “crowdsouring” in 2006, there were but a handful of vendors, websites and technologies breaking ground in this category. On the backs of the early settlers, an explosion of categories have developed. And with them, companies to cover their progress and the what’s next of the industry. One of those companies is Crowdsourcing.org. They’re doing a good job of serving as the “authoritative portal for the crowdsourcing and crowdfunding industry”. Now, Jeff Howe is jumping in to help make this very true. That’s good news. Anything that furthers these concepts and the companies that power them into the mainstream is a good thing. I particularly like the directory they are building to help keep order to the expanding crowdsourcing universe. Keep it up guys. Microtask is a Finnish member of the paid crowdsourcing fraternity that specializes in the digitization and annotation of archives, and the processing of handwritten forms. Essentially, converting all kinds of documents to high quality digital assets where OCR technology fails. Recently, the folks there paid Smartsheet a wonderful compliment with a blog post titled Smartsheet: the deadliest app in town?. Ville Miettinen the author, and CEO at Microtask, is an entertaining writer with very gracious things to say about Smartsheet. “The “killer app” is the dream of every rookie software designer. A program that’s so brilliant, so niche-bustingly successful, it spawns a whole new industry…. …So, the million (or more likely several billion) dollar question is: what will be the killer app for crowd labor? The piece of software that makes tapping into the crowd as common as firing up Firefox, or yelling at MS Word Help? We haven’t had the pleasure of working with Microtask yet, but suffice it to say, we’re predisposed to think of them first when we have digitation work to refer. Thanks Ville. Amazon.com is the runaway leader in online retail, nearly three times that of the closest competitor Staples. Is it likely that it will also be Amazon that is “the Amazon of Paid Crowdsourcing”? If they aren’t already, they are certainly on their way. When might the Mechanical Turk team open up an API on the other side of the equation, and enable other work crowds to be plugged into their exchange? Will they make it possible for Crowdsourcing companies like Elance, 99Designs, and oDesk to include their proprietary workers into the mix? This would certainly follow the pattern of their flagship retail business in which they serve as the intermediary order taker for others that fulfill the product. I’m not saying that this would be the highest priority for the Mechanical Turk team right now, but given their impressive API and attention to scale, they’d be the ones that could pull it off. And, add “Earth’s Biggest Work Exchange” to their sub-tagline. Quality results paid for at a fair price are the goals of both work requestors and workers in the crowdsourcing realm. However, the downdraft on quality by unscrupulous workers creates a corresponding plunge in pay rates. A high school principal friend of mine lamented recently that 90% of his time and energy is spent on 2% of the student body’s troublemakers and the handful of underperforming teachers. He wondered how much good could be generated if that 90% were instead channeled into the mass of productive kids. Alas, paid crowdsourcing follows a similar profile. Troublemakers consume a disproportionate amount of time and cost which imposes an unfortunate tax on submitted work. Once again, Panos Ipeirotis elegantly outlines this challenging landscape in an insightful post. “…The requesters already pay minimum wages for work that is worth minimum wage. How is that possible given the effective hourly rate of $2/hour? The basic problem: Spammers. Given that many large tasks attract spammers, most requesters rely on redundancy to ensure quality. So instead of having a single worker to do a task, they get 5 workers to work on it. This increases the effective rate from $2/hr to $10/hr. I’d highly recommend reading his entire post. He makes some very good suggestions for the Amazon Mechanical Turk service. Other paid crowdsourcing vendors like Elance and Crowdflower have implemented some creative technical and review oriented processes that significantly address the quality conundrum. And, we’ve written at length on different techniques to improve quality and discourage scammers. Despite, the downward forces on work quality and fair pay are still worthy adversaries. John Cook wondered in a provocative TechFlash post “why aren’t swing-for-the-fences upstarts… emerging in Seattle?” It raised a different question for me: “what drives a company to locate in a particular location?” Access to resources (talent, money, advisers…) used to dominate the answer but the internet has flattened that world significantly, especially in tech. Now, issues like taxes and regulation are playing a more significant role. The culture of entrepreneurship and tech transfer are more aggressive at other universities. Certainly those items, if accurate, would reduce the number of sluggers in Seattle. As importantly, I’d point to the advertisement directly below the printed version of the article. Idaho is encouraging businesses to relocate and enjoy superior business conditions in their state. Those of us who invest considerable effort and assume financial risk with hopes of reaping the rewards can certainly appreciate the comparisons Idaho touts on the website it targets at businesses. Tax and regulation issues have become more central to the location decision process. In today’s electronically connected world, traditional constraints imposed by location can mostly be overcome. We’re seeing Smartsheet’s customers use our work collaboration technology to coordinate geographically disperse teams, including outsourcing development, legal, hr and marketing work to third parties connected electronically to their company. These too are geographically elsewhere. Add to that the access to paid crowdsourcing, and physical location of a company’s HQ matters even less. See my xconomy post for more examples. Not all world beating entrepreneurs will be home grown, so we have to have compelling reasons attracting them to Seattle. We often cite the amazing outdoors aesthetic and quality of life here, but many “swing for the fences” entrepreneurs are too busy being maniacally focused on their business to care. Whether it’s Internet research, getting a legal opinion, developing a website, or locating a company, the business incentives are all the same. Where can I get the best results for the lowest price? If Seattle wants “swing for the fences” entrepreneurs, we need to make WA state a top choice for swing for the fences financial return. Fresh out of the gate is Getting Results from Crowdsourcing, a site that looks to be dedicated to crowdsourcing help, recommendations and details about…. crowdsourcing. I like their map, it’s a good visual of the categories. They are requesting expert content. So, for any of you that have experiences and information that could be useful to us all, consider posting it with them. Millions of online workers are waiting each day for the thousands of companies that request their special services. If you're a regular crowdsourcer, you've likely come up the learning curve and are adept at successfully conducting significant amounts of work online with relative ease. If you are not a regular, but occasionally need the benefits, you often have as good a chance of frustration as you do of success. This is where the ‘crowdsourcing consultant’ comes in. A creative, process and human factors expert that excels at breaking work into clearly understood instruction sets and objectives to achieve a specific result. Must be good with data, excellent with the concise written word, and tireless at refining for quality. There are many great crowdsourcing tools that help you get an amazing range of work done quickly, accurately and inexpensively. Pick the right tool, design proper instructions and process, and manage the stages properly to completion. However, most requests do not fit nicely into a simple set-up wizard. So, there is an opportunity for companies, individuals and services firms to become intermediaries or "translators" between the requestor and the workforce using the crowdsourcing technologies currently available - specialists that serve as resources to help clients design and manage online work. Every other technology category has them, but search on "crowdsourcing consultant" and it looks like Jason Spector will have to handle the whole industry all by himself. In our paid crowdsourcing report, we use the rise of eCommerce as an outline for paid crowdsourcing's path to the mainstream. Online commerce is mainstream now for many reasons, but primarily the list below on the left. It stands to reason that shopping for work done via an online on-demand workforce would need to meet these same criteria to become mainstream. The ingredients are available for mainstream success with crowdsourcing tools, but novice or occasional customers routinely struggle with 2 and 3 in the crowdsourcing list above. Vendors like 99Designs and CastingWords alleviate this by providing very specifically targeted services. This dramatically improves the likelihood of success. However, for the those vendor tools where a client's creativity is the only barrier to type of work requested, there are hundreds of tricks, tips and designs that only an expert can provide which improve the quality of results. The overly simplified matrix above is intended to provide a framework for understanding where and how crowdsourcing consultants are needed. Specific Work is work with expected results that are well understood, such as Design a Logo, or Transcribe an Audio File. Ad-hoc Work is work with expected results that can vary widely depending on definition, such as Finding a List of Blogs, or Writing a Regression Test Script. The expected results vary by the requester. And, therefore, the setup and processing requirements are more difficult. With a Specific Task like 'create a logo', crowdsourcing firms like 99Designs can guide the requestor through a nearly perfect setup process to ensure satisfactory results. Opening up the aperture on what people can request lessens a crowdsourcing vendor's ability to provide automated client guiderails. It's as we enter these types of work that crowdsourcing consultants begin to provide tremendous value. They can serve as the automated guiderails for the infinitely variable setup processes. Smartsheet is happy to continue providing the crowdsourcing services for these projects, but a better model is for industry specialists to work across vendor platforms to provide clients with truly exceptional solutions. Mixing and matching crowdsourcing technologies with best practices will steadily increase in demand. Getting in on the ground floor as a crowdsourcing process expert in a business environment hungry for productivity gains could be a very good thing.